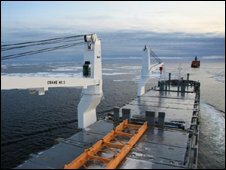 Two German ships have become the first Western commercial vessels to navigate the Northeast Passage - a shipping route which goes from Asia to Europe around the Russian Arctic. One of the captains told the BBC that their journey opened new, exciting possibilities for the whole international shipping community. Valeriy Durov, shipmaster of The Beluga Foresight, is your archetypal captain: a short man with a big moustache and a sense of great authority in his voice. "I was slightly surprised by what we saw," he told us as we stood on the bridge of his cargo lifter. "There was virtually no ice on most of the route. Twenty years ago, when I worked in the eastern part of the Arctic, I couldn't even imagine something like this. "I think it will soon be possible to navigate the Northeast Passage all year round. We were escorted by an ice-breaker but, frankly, we could have done without it. This is great news for our industry." Mr Durov's ship had just arrived in Arkhangel, a major sea port in north-western Russia. It was met by a cold, unpleasant drizzle and grey autumnal skies. The numerous potholes on the port's berths had turned into deep puddles. To get to the mooring wall, you had to jump over them, navigating around endless stacks of pipes, wood planks and containers rather like a character in an old-fashioned computer game. The scene was anything but glamorous. But it deserved so much more. The Beluga Foresight is one of those ships that make history. Experts in Russia say its journey from South Korea to the Russian North was a real breakthrough. In the past, no foreign ships were allowed to cross the Northeast Passage. But now Russia's security concerns have given way to the desire for a slice of the fat pie which is the international shipping business. "This is an event of huge strategic importance," said chief commercial officer of the Arkhangel Sea Port Viktor Vorobyov. "It will signal the rebirth of this shipping route, and the renaissance of the whole of the Russian North." Mr Vorobyov hopes that his port will soon become a major hub for trans-continental shipping. And, from the business point of view, this would make perfect sense. Going via the Russian Arctic cuts the distance from, say, South Korea to the Netherlands by up to 25%. This means the time in transit can be cut by as much as 10 days. And, as Captain Durov points out, "it is much safer up north: there are no pirates". The Beluga Foresight is, then, setting a very important precedent. 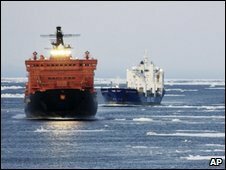 Whether other ships will follow in its wake is still unclear: industry insiders point out that Russia's Arctic infrastructure is virtually non-existent, while the bureaucratic procedures are complicated, costly and time-consuming. But the opportunity is now there. And - as far as sailors are concerned - a fanfare for a triumph of shipping might be in order. For environmentalists, however, this journey is more of a call for alarm bells. 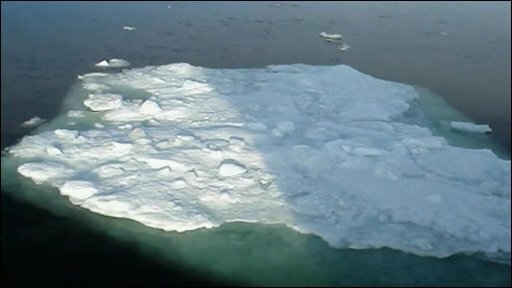 "This is a very clear signal of how weak the Arctic ice has become," says Alexei Kokorin of WWF Russia. "The area of really heavy ice in the Arctic is now 10 times smaller than 10 or 20 years ago. Global warming is becoming more and more dominant - and it will affect all of us". Some experts predict that there will probably be no ice at all left in the Arctic within the next few decades. This might be good news for people like Captain Durov who will no longer have to keep a copy of Navigating Through Ice next to his seat on the bridge. But it might also spell disaster for low-lying areas around the world, from Dhaka to London.